Recent years have witnessed a revival of interest in holy figures in Canada. From the reputations of popes John Paul II and Benedict XVI as prolific saint-makers to the canonization of two figures associated with Canada - Brother Andre Bessette in 2010 and Kateri Tekakwitha in 2012 - saints are suddenly in the news and a topic of conversation. 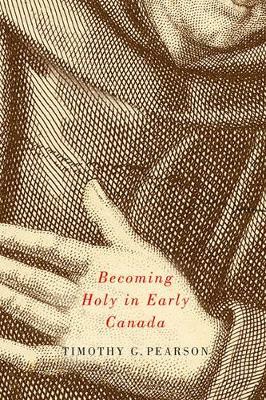 In Becoming Holy in Early Canada, Timothy Pearson explores the roots of sanctity in Canada to discover why reputations for holiness developed in the early colonial period and how saints were made in the local and immediate contexts of everyday life. Pearson weaves together the histories of well-known figures such as Marie de l'Incarnation with those of largely forgotten local saints such as lay brother and carpenter Didace Pelletier and the Algonquin martyr Joseph Onahare. Adopting an approach that draws on performance theory, ritual studies, and lived religion, he unravels the expectations, interactions, and negotiations that constituted holy performances. Because holy reputations developed over the course of individuals' lifetimes and in after-death relationships with local faith communities through belief in miracles, holy lives are best read as local, embedded, and contextualized histories. Placing colonial holy figures between the poles of local expectation and the universal Catholic theology of sanctity, Becoming Holy in Early Canada shows how reputations developed and individuals became local saints long before they came to the attention of the church in Rome.